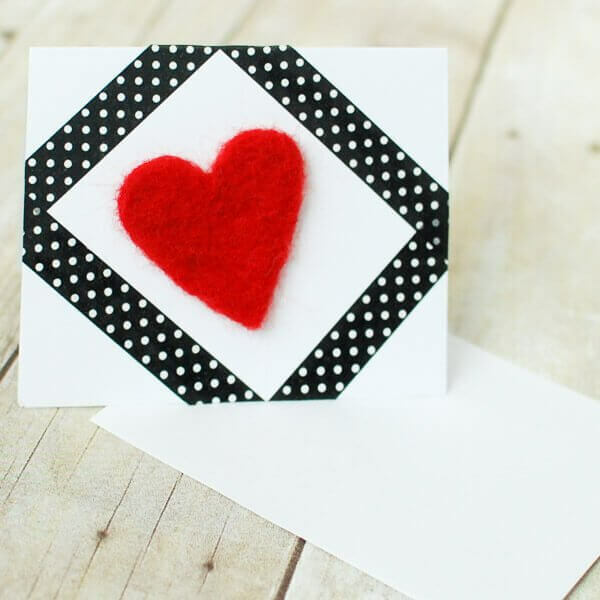 Since Valentine’s Day is around the corner, I thought it be be nice to end our week of needle felting fun with this easy idea to make a pretty “heart”felt card. The process for making the heart is exactly the same as used in my Needle Felted Leaf Photo Tutorial. And if you are completely new to needle felting (or just need a refresher), you can always reference by Introduction to Needle Felting post. Again, we will follow the same steps used Needle Felted Leaf Photo Tutorial, so if you would like a photo step by step just click here. To begin, place your cookie cutter on your foam pad and fill it loosely with your wool roving. Start poking away at the wool with your needle, taking care not to stab too deeply or your wool will start getting stuck in your foam. Make sure to work the wool into all your corners. Once your have compacted your wool a bit, flip the cutter and wool over and do the same to the other side. When you feel like you have your shape the way you like it, just pop the heart out of the cutter. Now you can leave it as is or work it some more, or even add some detail like I did in the Needle Felted Leaf Photo Tutorial. I made my card for my mom and wanted her to be able to take off the heart and keep it as an ornament or embellishment or whatever she wished, so I used double-sided tape to attach the heart to the card, but you could also glue it or even at a stitch through the heart and card to sew it on. Once attached, the only thing left is to decorate it. I used a few strips of washi tape to add a little more embellishment. You can get as creative as you would like … there is no limit … think stickers, buttons, glitter … whatever you like! Be sure to check out my other needle felted projects here. Kara, I never would have thought to include needle felting when making a handmade card. This is simply adorable! With Valentines Day just around the corner, this is a very timely and useful post! 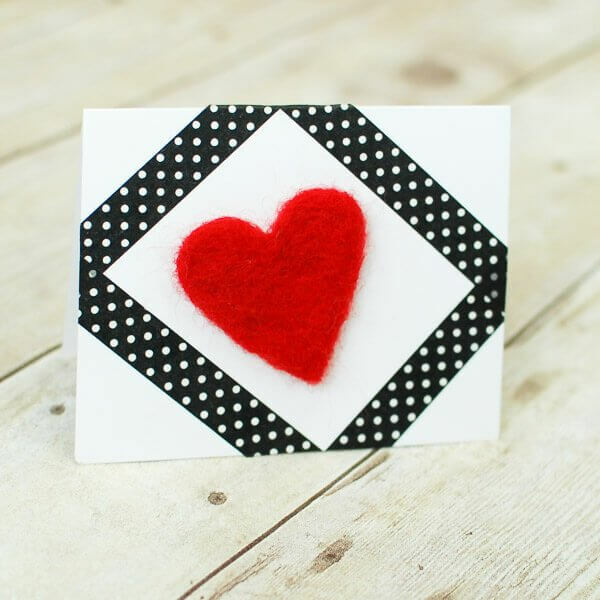 The Needle Felted Heart Valentine’s Day Card is simple to make but will really make an impact. Also, my daughters would love to make this card. Thanks for providing such a great idea! I just tried needle felting for the first time, I was so surprised how easy it was!